If you are like most presenters, you will believe that your job is to do whatever is required to get a presentation time slot and once the meeting starts, we present who we are & what we do. We are expecting the customer to figure out how they can leverage our solution. The Presentation meeting should be used to elicit information that could not be uncovered over phone & emails. During introduction itself, you could request the customer to talk about his company and what are they trying to achieve where your company could be of help. Eliciting information is possible only if you know what questions are unanswered and design the presentation such that you can ask open ended questions. e.g. A slide on Key Customer Issues can list the top 4-5 issues. You can then ask the Customer if they can share their experience. While summarizing, it may be a good idea to ask for what they see as the next steps and what will be their purchase process. You should ideally store the presentation you give to each customer in a CRM software. You should also store the key comments made by the customer in the CRM so that other team members also understand the customer better and can help you prepare calibrated responses. You can monitor follow up activities by adding them in the CRM and assigning them to the concerned person. It is said that ‘Silence is Golden’. 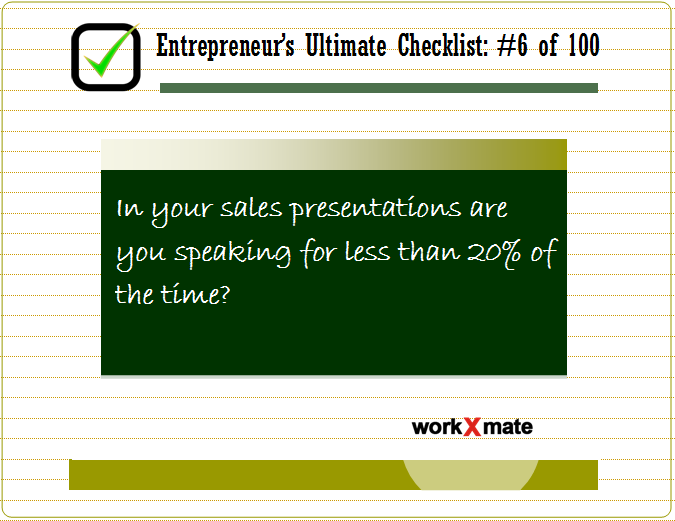 In a presentation, speaking less than 20% can prove that right.